HVAC prepares students for a career that is in demand and enables them to earn certifications that will put them ahead in the job market. This two-year high school program prepares students in the field of Heating, Ventilation, Air Conditioning and Refrigeration. Students will experience job estimating, installation and service of refrigeration systems, controls, mechanical components and general heating systems; and diagnostics and problem solving in residential, industrial and commercial situations. Students will learn about engineering and designing HVAC & R systems. HVAC is certified by the National Center for Construction Education and Research and the Ohio Department of Education. Hocking College accepts credit hours earned through the Contren Learning Series, the NCCER curriculum. Sinclair Community College accepts the first year of the HVAC high school program as Level I training. A $3,000 Tech Prep Scholarship through the Miami Valley Tech Prep Consortium to Sinclair Community College is available to students who meet the eligibility requirements. Students will have the opportunity to earn certification in EPA 608 and 410A. In the second year of the program, students may be eligible to start an apprenticeship program. Seniors are eligible for early job placement in the second half of the school year. The criteria for placement include instructor recommendation, grade point average and attendance. 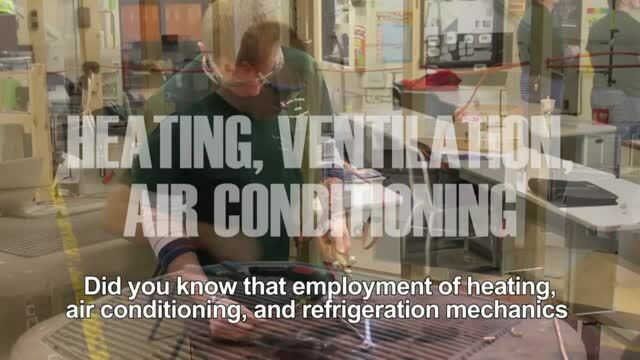 HVAC students participate in SkillsUSA, a partnership of students, teachers and industry, working together to ensure Americal has a skilled workforce. All students also have the opportunity to participate in the Tech Prep Showcase through the Miami Valley Tech Prep Consortium. For more information, contact instructor Deon Gephart at 513-932-5677 ext. 5223 or email deon.gephart@mywccc.org.